AppCoiner definitely caught my attention by its simple concept and seemingly easy way to earn some good money! Review an app and get paid in cash, what have I been missing out on all this while? 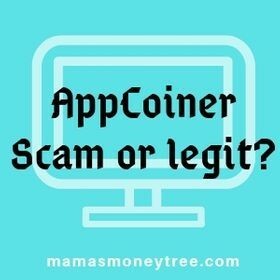 Is AppCoiner a scam or a real deal? When a make money online product seems too good to be true, it usually is. Upon just a bit of probing beneath the surface, the truth was revealed. And that is what I am going to show you here: the cat inside the bag. AppCoiner is made to be seen as an app reviewing platform on the surface, but what it truly is, is in fact affiliate marketing. You get paid only when people buy the app that you review, through your affiliate links. On top of not being transparent about how things work, they even want you to pay an upfront fee, so you are actually paying to work for them. And you could possibly not get a single cent in return after reviewing many apps, because it depends on your own marketing efforts to drive traffic to your affiliate links. If you are tired of wasting your time and money on scams, see my #1 recommendation to make money online the proper way. Read on for the in-depth review of AppCoiner. There are thousands of apps in the market. In order to stand out from the rest, the app developers need people to test out and write reviews of their apps. AppCoiner makes themselves to be the bridge between the app developers and reviewers, connecting to the developers and giving you access to the many apps to test out and review. From their promotional page and video, it seems like such a simple idea. Get paid to test out their apps on your phone or tablet. Choose an app to test out. Login to your AppCoiner members account and write your review of the app. 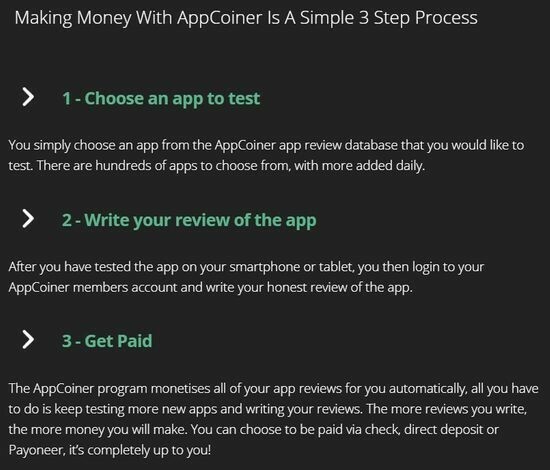 The AppCoiner program monetises all your reviews automatically. Just keep testing and writing reviews, and you will make more money. This does sound like such a great way to earn some side income in your free time! In fact, the income calculator on the AppCoiner promotional page shows a default setting that if you write 3 reviews per day, at an average of $15 per review, simply by doing this for 5 days a week, you get a monthly income of $975! Woohoo! I’m in! Who’s not? Oh wait… you mean there’s a catch? What the owners of AppCoiner has not revealed anywhere in the promotional video or webpage, except for inside the middle box below, hidden strategically, is that you have to write the reviews on your own website. And you only get paid when your readers buy the app through your affiliate link. This has NEVER been communicated before you purchase the access to review their apps. To me, this is pure deception. There is absolutely nothing wrong with affiliate marketing. It is a legit and lucrative way to make money online, if you know the right way. What is very wrong is hiding the real identity of AppCoiner as an affiliate marketing program for the apps that are being tested. Because to make money with affiliate marketing, it takes a lot more work. It can pay off big time, there are many successful affiliate marketers who are millionaires. But you need to work at it, and you need to know how to do it properly. In fact, affiliate marketing is how I am monetising my own websites, and I learnt everything from scratch through this amazing training platform, complete with the necessary tools and an entire community that is now like family to me. For you to write reviews of the apps on your own website, you do need to first build your own website. Secondly, you need to drive traffic to your website, so people will read your reviews, and some will be convinced to buy the apps through the affiliate links that you embed on the review pages, and then you get to earn. But how do you get people to visit a brand new website? Well, of course you can share with family and friends, and use your own network as well as groups on social media platforms, but all these are going to be so time-consuming. And they may not be the right target group, because they may not even be interested to play around with apps in the first place. If you were to pay for traffic to come to your site, the costs incurred will be sky-high, because you are a beginner who has not yet grasped your target customers’ behaviour patterns, their needs, or even where to find them in the first place. So a lot of money will be going down the drain in the time that you take to master the art of paid traffic. The best way to get traffic to any site is free. It is called organic traffic. This is traffic that search engines send to your website because when people search for some terms on the search engines, your site appears on the first page of their search results. So you get massive amounts of free traffic, once you rank on page 1. In fact, once you get into affiliate marketing, you will find there are thousands of niches that you can choose from, which are much more lucrative than AppCoiner. In affiliate marketing, you are helping the developer of the apps advertise their products, for free! They do not pay you for helping them to advertise. But once your website visitors buy their apps through your affiliate links, the apps developer pays you a commission for sending customers to them. So AppCoiner got it all wrong. They want you to pay an upfront fee, for you doing all the work: setting up your own website (with domain and hosting costs that you have to shoulder) and writing reviews. They say it is for accessing their apps. No legit affiliate marketing program should require you to pay any fee. Check out the big ones like Amazon and ClickBank. They are all free to join, and you can start accessing their affiliate links to promote their products once you are approved. The only ones benefiting from this whole AppCoiner system are the owners of AppCoiner themselves, who has made no appearance so far. When there is no name attached to a program or product, who do you trust? Who is to be accountable for the integrity of the program? AppCoiner is a product on ClickBank, which is an affiliate network. So there are affiliates trying to promote AppCoiner to unsuspecting people. 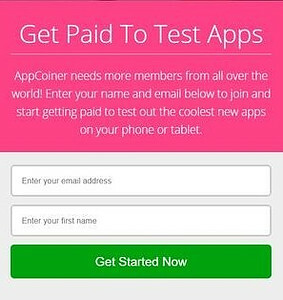 When you pay $27 to buy AppCoiner to review the apps in their database, the affiliates promoting AppCoiner may earn a commission, depending on how you landed on the webpage of AppCoiner. So as you do your research on the internet, do not take everything at face value. Reviews are easy to fake. Testimonies are easy to fake. Even real people with real faces can be actors engaged to give their ‘honest’ reviews of a product. Is AppCoiner a scam or not? Affiliate marketing is affiliate marketing, it is a legit and proven way to make money, but it takes work and perseverance. Hiding behind the mask of an apps reviewing platform makes the job seem so simple, and the money so easy. To me, the intent on deception is clear. So yes, AppCoiner is a scam. Even though there is a 60-day money back guarantee, I have zero trust in this company’s integrity, so I really wouldn’t bank on it. I have answered the question ‘Is AppCoiner a scam?’. We know it is not going to make you any money anytime soon. When you figure out affiliate marketing, the sky is your limit, you really won’t need AppCoiner at all. You can start now if you wish, take a walk inside the free member section of this training platform that teaches the right way to earn through affiliate marketing, with step by step guidance and tools to build a website, and populating it with content that will get you free organic traffic. What is Affiliate Bots? Another scam?